In October 2013, when I bought my tickets to see Cher’s Dressed to Kill tour, which would be playing down the street from my house in the then-distant future of May 2014, my mother asked with mock hurt in her voice why I hadn’t invited her to see the show with me. In honor of National Coming Out Day, we bring you the coming out musings of David Levy, long-time Keshet member and board member, who explains why he doesn’t think the coming out process is ever over… and why that’s not a bad thing. 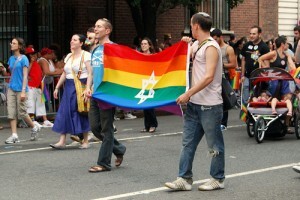 JewishBoston.com: What’s Jewish about Gay Pride? In 1992, the summer before I started high school, I saw Falsettos on my second-ever trip to Broadway. For those of you unfamiliar with the show, it was the combination of two earlier, ground-breaking off-Broadway musicals by songwriter William Finn: March of the Falsettos, which told the story of Marvin, a Jewish man in his forties who had left his wife and son for a male lover, but who wanted a “tight-knit family” that included all of them; and its sequel, Falsettoland, in which Marvin’s son struggles with becoming bar mitzvah while Marvin’s lover struggles with the disease that would come to be known AIDS. I don’t know that there’s ever been another show — or ever will be — that spoke so directly to me. A large part of that is simply that it’s the first time I can remember seeing gay lives portrayed, well, anywhere. I didn’t know any gay adults, and while I had an inkling that some of my friends might also be gay, none of us had yet spoken the words out loud to each other. Originally published as part of Torah Queeries. Every Shabbat evening, Jews around the world recall this week’s Torah portion by blessing their sons with the words “May God make you like Ephraim and Manasseh,” fulfilling Jacob’s deathbed pronouncement. I did not grow up with this particular tradition in my family, so when I learned about it, two questions immediately sprang to mind: If Jacob says that all of Israel shall invoke blessings in this way, why do we limit our use of the blessing to boys? Perhaps more fundamentally, what’s so special about Ephraim and Manasseh that we pray to make our children like them? Originally published as part of Torah Queeries, and then later republished on Keshet’s Blog on MyJewishLearning.com. Jews read sections of the Torah each week, and these sections, known as parshiyot, inspire endless examination year after year. Each week we will bring you regular essays examining these portions from a queer perspective, drawn from the book Torah Queeries: Weekly Commentaries on the Hebrew Bible and the Torah Queeries online collection. This week, David Levy looks at Biblical twins Jacob and Esau through the lens of nature versus nurture. “The Birth of Esau and Jacob,” Master of Jean de Mandeville. Image courtesy of Wiki Commons. Toldot, the name given to this week’s parasha, has many layers to its definition. Coming from the Hebrew root meaning “birth,” it literally means “generations.” Its use in the Torah introduces genealogical lists, and also marks the beginning of important stories related to the members of Abraham’s particular genealogical line – some translations even give the word as it appears at the beginning of this week’s parasha as “story.” Toldot is a particularly fitting name for this section of the Torah, because the story begins with the birth of Jacob and Esau, and hinges on both the relationship between the older and younger generations and the question of who shall lead the generations to follow. To me, Parashat Toldot reads like a divine statement on the “nature versus nurture” debate: are our identities and destinies somehow inherent in us, or are we shaped by the environment in which we are brought up, formed by the generation before us? In queer culture, this debate at times looms large. Are we “born that way” or are there external factors that “make us gay”? And if we adopt children, will our nurturing homes be enough to bring up a next generation in our image, or will adopted children turn out like their birth parents…whoever they might be?